Yes, it’s good ol’ George Osborne of the 7 (or is it 8?) jobs. We pair this song with the Flanders and Swann standard the Gas Man Cometh, which speaks of an altogether different age of labour relations where every work man had just one job and – subject of course to Union rules and demarcations – tried to create work for his fellow artisans. But in our days of the gig economy, you might need 6 or 7 low-paying jobs just to keep the wolf from the door. As exemplified by our ex-chancellor. 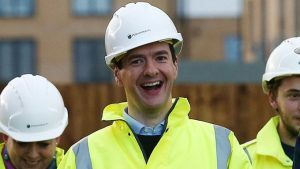 And there was Georgie Osborne, bless his little cotton socks. So it was on a Monday morning that I called on my MP.